Team Smiley 2016: (Left to Right) Melissa, Laina, Colby, Marissa, and Brooke. Hi everyone! My name is Melissa and I’m a junior at Saint Vincent College where I am pursuing a major in Marketing and a minor in Graphic Design. I love baking, traveling, going on adventures, making arts and crafts, and spending time with my family and friends. Most of all, I love spending time with my new friends on Team Smiley! I am a food fanatic, and my favorite Eat’n Park meal is the Chicken Fajita Flatbread. I also love all varieties of Smiley Cookies, but my favorite seasonal style is the Halloween Smiley Cookie with the candy corn! I’m looking forward to an amazing summer full of meeting new people, learning new things, and spreading smiles with Smiley and the rest of my wonderful team! Hi, cookie lovers! My name is Laina, and I am a junior at the University of Akron, studying Public Relations with a minor in Marketing. I have been a team member at our Sewickley location for the past three years, so I am very excited to experience a company that I know and love on a whole new level! My favorite meal from Eat’n Park is anything that goes well with our famous ranch (which is the best that there is)! When I’m not kicking it with Smiley and the rest of our awesome team, I like to go on road trips, crank up some music, or binge watch my favorite series on Netflix. I am excited to create smiles all summer long for the guests who make this company so great! Hello friends! My name is Colby and I am a current student at Duquesne University studying both Digital Media Arts and Public Relations & Advertising! When I’m not hanging out with Team Smiley, I enjoy spending time with friends and family, going to Pirate games, trying all types of new food, and singing. My favorite Eat’n Park menu item is the Chicken Tenders with French fries or mashed potatoes (and a side of ranch of course!) You might be interested to know that I am a third-generation Eat’n Park team member as my grandmother worked as a waitress for 15 years and my mother as a waitress for 26 years (and counting!) at our Avalon location. Before Team Smiley, I also worked on the front lines in Avalon for two and a half years. My main goal this summer is to learn how to ride a bike, and I’m hoping Smiley can help teach me! I’m looking forward to traveling around with Smiley and meeting tons of new people to share smiles and fun times with! Hey everyone! My name is Marissa and I am a senior at the University of Pittsburgh. I am majoring in Media and Professional Communications, minoring in Sociology, and receiving three certificates in Nonprofit Management, Digital Media, and Corporate and Community Relations. (You could say I’m a bit busy!) I am super excited to be a part of this year’s Team Smiley and am keen to learn more about Eat’n Park, our reputable brand, and how the company is active in the surrounding communities. Coming from New York we do things a bit different, so I am eager to see how Pittsburgh gets down in the summer. :-) When I am not jamming out in the Cookie Cruiser, I love spending quality time with my family and friends, especially when we go on adventures or take week long vacations to exotic locations. The quote from the Fresh Prince theme song “chillin' out maxin' relaxin' all cool” pretty much sums up how I like to spend my free time. All in all, my goal for this summer is to share my smile and a Smiley Cookie with those who might need a little treat to sweeten up their day! Hey all! My name is Brooke and I am a senior at Duquesne University studying Integrated Marketing Communication and Intercultural Studies. Other than hanging out with Smiley all over the tri-state area, I like to spend my time in the dance studio and adventuring with my friends. This exploratory drive has led me to Team Smiley and I am excited to eat my way through our restaurants and your communities! One Eat’n Park meal just isn’t enough! 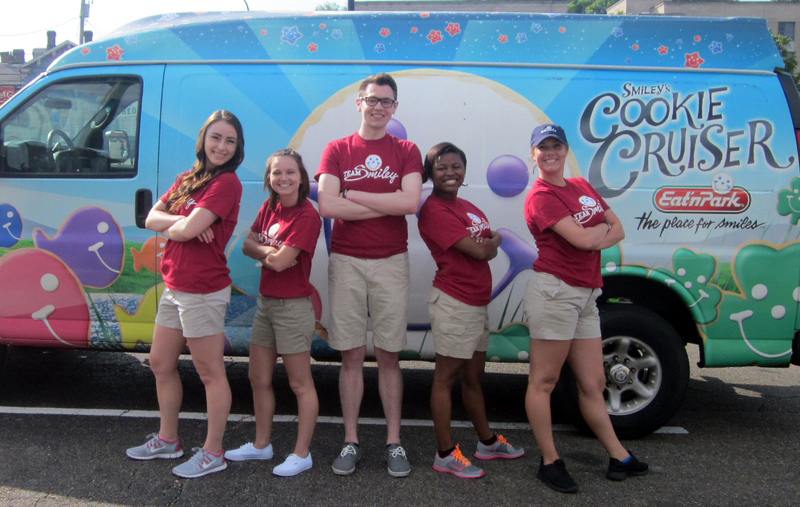 This summer, I am looking forward to visiting the zoo and Pirate’s games so make sure to be on the look out for Smiley and our team!